Some of you may have taken a double-take and we won't blame you. After all, this is the first review that we have written for almost two-and-half years! 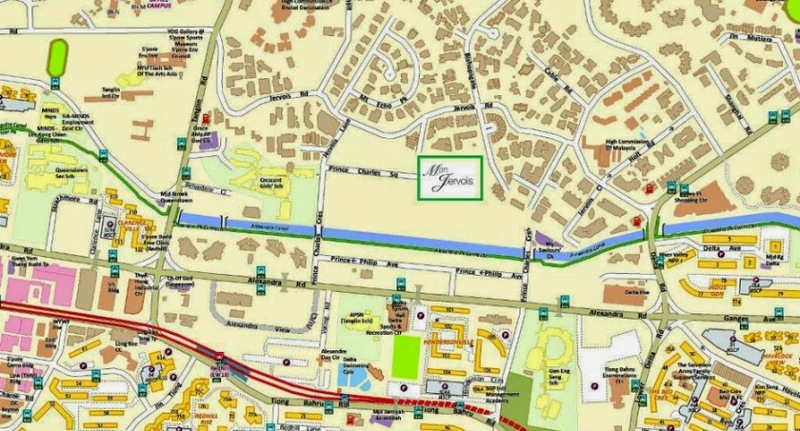 The wife and I had to go back over 300 blog-posts before we found our last review - of Watertown in Punggol - that we did back in Feb 14, 2012. Mon Jervois is not (strictly speaking) a "new" project : The wife and I was told that the project had previewed about a year ago but was not marketed aggressively thereafter, probably because of poor marketing sentiments. 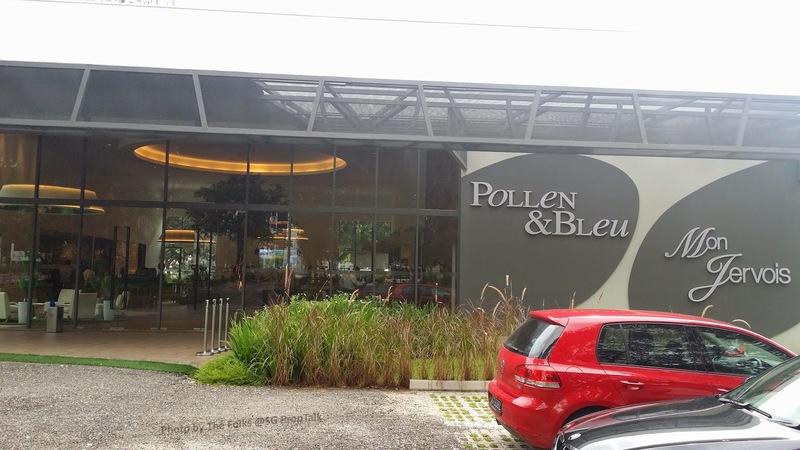 The sales gallery of Mon Jervois, which apparently was renovated recently and re-opened in May this year, is located next to 87 Zion Road. If you are traveling along Ganges Road towards Havelock Road, be prepared to turn into this small slip road (we forgot to note the name, sorry) on your left just before you hit the Havelock Road junction else you will drive right pass it. 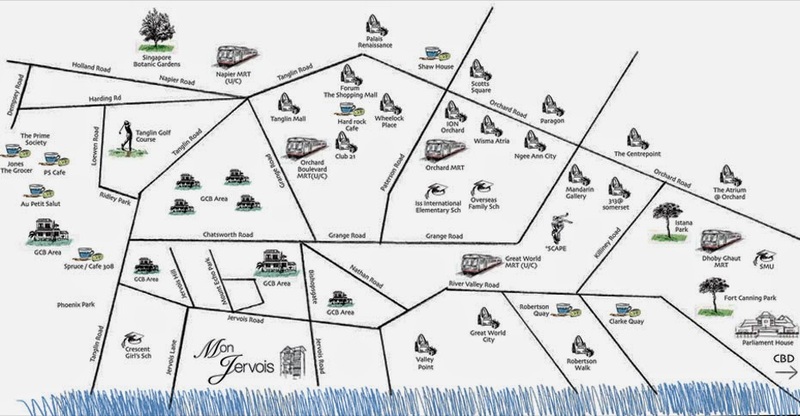 Mon Jervois (the actual development) is located on Jervois Road within District 10 (i.e. the "correct" side of the canal, else it becomes District 3, which is considered less "prime" based on traditional norm). It is nestled within a cluster of private (and primarily freehold) residential developments, and across from the Good Class Bungalows (GCB) area at Chatsworth Park. The wife and I have always liked the tranquillity around the area, without being too far away from the convenience and bustle of the city. The shopping and dining in Orchard Road/River Valley are only minutes' drive away and if one works within the CBD, you have the option of either a short drive or taking the train - we were told that the Redhill MRT station is a mere 7 minutes' walk away - this was supposedly confirmed by one of the market agent who actually did the legwork. 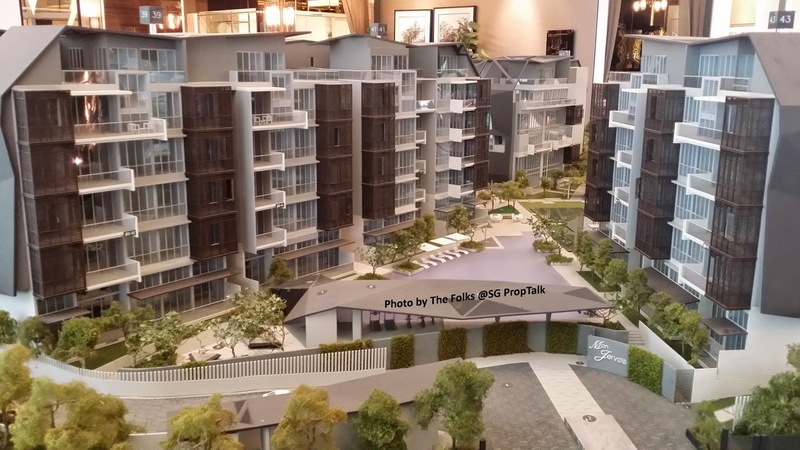 But unlikely most of your immediate neighbours, Mon Jervois is a leasehold development. The project consists of 5 low-rise (5 storeys) blocks of 109 units. The apartment configurations range from 1- to 4-bedroom apartments. The first thing that the wife and I were pleasantly surprised to discover was that there are actually quite a few more parking lots (135, including 3 handicapped lots) than units at Mon Jervois. This will at least allow SOME of the residents to park their second car within the estate and maybe offer a few parking spaces for visitors, which is going to be especially useful - we will come to this in awhile. The land parcel that Mon Jervois sits on was acquired by SingLand in February 2012 via a government land sales (GLS) exercise. SingLand purportedly paid $118.9 million for the land, which worked out to be around $862psf ppr. And just to provide you with some perspective, the current asking price for a unit in Mon Jervois is in excess of $1,900psf! 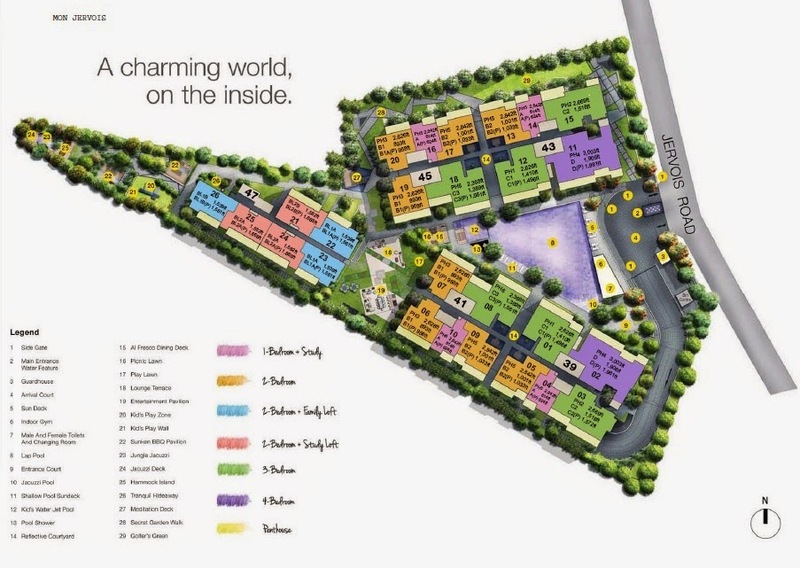 For those of you who are not familiar with SingLand, they are the same developer that are responsible for projects like Trizon, Thomson Three and Alex Residences. For the kind of money that Mon Jervois is asking, one can reasonably expect (and get) full facilities within the development. The usual "bells and whistles" exist but the one thing that caught our eyes was the entertainment pavilion with its triangular canopy roof. This area can cater to a party of 8 - 10 people and is equipped with everything you need (fridge, cooker, dining table and chairs etc.) to cook and serve up a great party. So even if your dining room is a tad small (we will also come back to this later), you will at least have the option to host your dinner event here, where all your guests won't be rubbing shoulders with each other... literally. But the #1 problem the wife and I have with alfresco dining is that it is typically a "sweaty affair" with the kind of weather we get in Singapore. So we sure hope that the entertainment pavilion will provide sufficient ceiling fans. 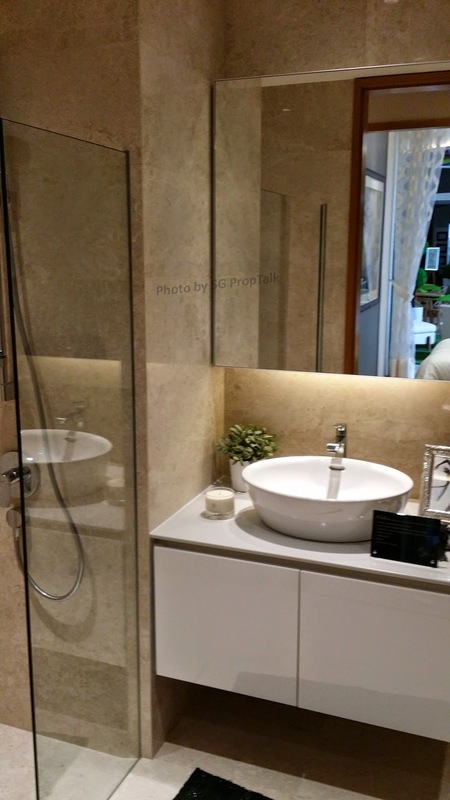 There was only one showflat type on display - a 3-bedroom (Type C3) unit. The size of this unit type is 1,389sqft, but with 2 sets of balconies (PES), we reckon the interior living area is probably a tad under 1,300sqft. 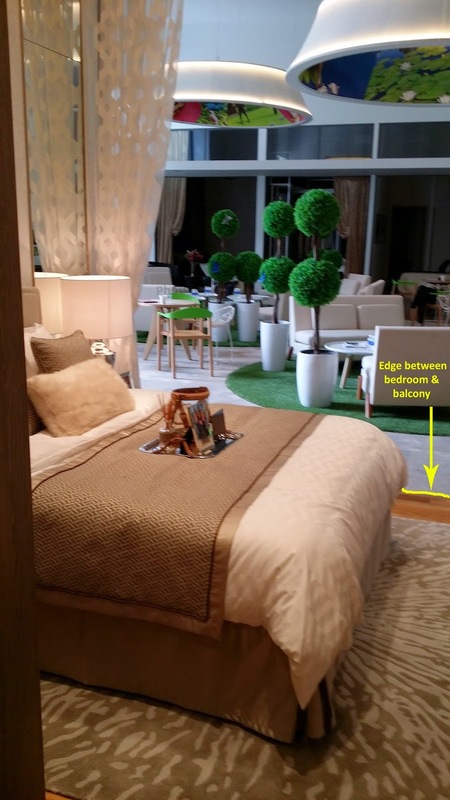 The living and dining area is a "straight through" rectangle so there is no real separation between the two areas. 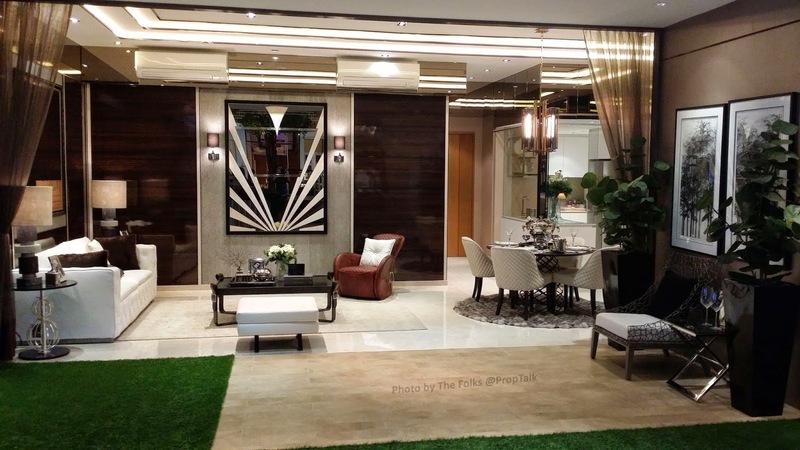 Trying to fit a 6-seater table into the dining area is likely to be a challenge (and here's where the "entertainment pavilion" comes in handy). Even with the 4-seater round table on display, the wife and I were scratching our heads over how to manoeuvre a set of 3+2 sofa in the living room to accommodate a TV console. 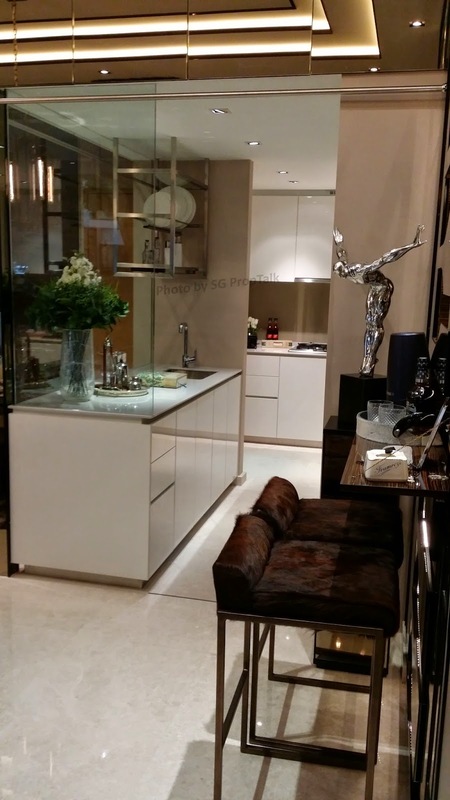 But we like the good quality marble flooring that are provided in the living/dining area. The kitchen is decent-sized and comes equipped with high-end "Miele" appliances. But you do not get the dish-dryer you see in the photo. There are two entrances into the kitchen - one as you enter through the main door and the other from the dining area - with swing doors at both ends. What we especially liked about the kitchen is that the cooking hood/hob are positioned at the end and next to the yard area. This allows for better ventilation for all the smoke and smell generated when you are doing heavy cooking. The yard area houses the washer & drying (provided) and a utility room plus bathroom. We were unable to get photos of the yard area but it looked decent enough in size to do your laundry/ironing. The utility room and bathroom are a tad small but within the norm of most new apartments these days. The bedrooms are again typical of the size you get with new development these days. We reckon a super-single bed will probably be your best bet in the common bedrooms while you may wish to consider a queen-sized bed in the Master bedroom. 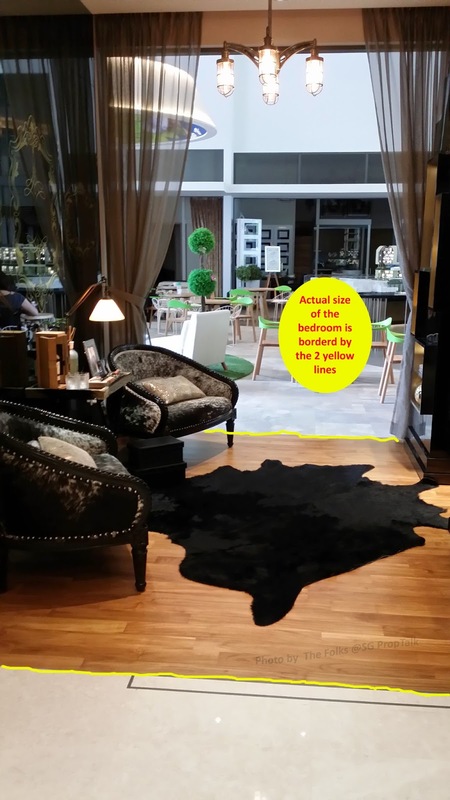 This is assuming you do want some walking spaces around the rooms. The bedrooms all come with parquet flooring, which again looked to be of pretty decent quality. 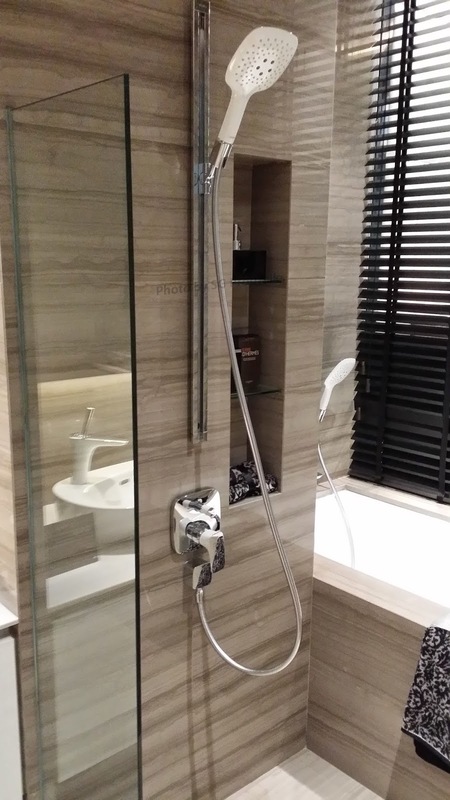 Both the common and Master bathrooms are decked with good-quality homogenous tiles and premium fittings from "Hansgrohe" and "Laufen". The Master bathroom is rather spacious and we especially liked the concept of having the standing shower next to the bathtub, which save space, as opposed to having a separate shower cubicle. Overall speaking, the wife and I were rather pleased with the 3-bedder layout. The unit felt more spacious than the 1,300sqft that it is supposed to be. The high ceiling probably helped - the showflat has ceiling height of 4.7metres, which is what you get for the ground-floor units. The typical ceiling height for apartments on higher floors are 3.3metres. 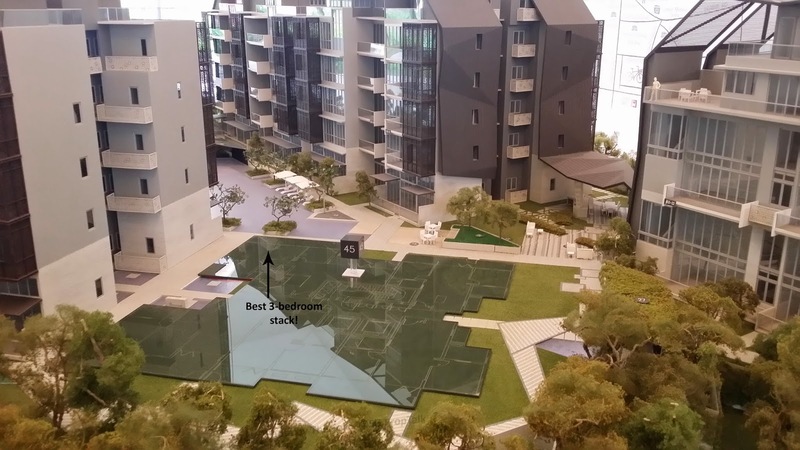 The 3-bedroom apartments are available in all the blocks within Mon Jervois except Block 47. But we felt that the best 3-bedder stack is located in Block 45 - this stack faces inward towards the swimming pool. And the stack even comes with an auspicious house number - 18. Huat ah! 1) The location, which is tranquil yet not "ulu". 2) There are more parking lots than units - if you are familiar with that stretch of Jervois Road you will appreciate what we mean. Street parking is a big challenge both for residents with multiple cars and for visitors who drive. 3) The good layout of the 3-bedroom apartment, and the quality of the furnishings and fittings provided within. 1) The $1,900+sqft price tag is a tad steep, especially for 99-year leasehold development, albeit this being in District 10. The 3-bedder will cost you in excess of $2.65 million. 2) And speaking of leasehold, we cannot help but wonder how well the prices (not to mention self-esteem of owners) at Mon Jervois will hold against its immediate neighbours like Jervois Regency, Jervois Gardens, Jervois Lodge, Jervois Ville or Dormer Park - most of which are smaller and older developments but all of freehold tenure. 3) We are only identify one primary school - the newly installed Alexandra Primary - that is borderline within 1-km of Mon Jervois. So this may be a concern for parents with primary school going kids and no affiliations. Mon Jervois is one of the few new developments that the wife and I are rather impressed about and can put a "like" to. But the bit that we are struggling with is whether we liked it enough to pay over $2.65 million for it. P/S: If you are heading down to the Mon Jervoissales gallery and wish to be attended by a marketing agent that is extremely pleasant and non-pushy, do give us a shout. We can provide you with a name but will rather not post it outright on our blog. And rest assured there is not vested interest with our recommendation! No Comment to " Mon Jervois (Review) "